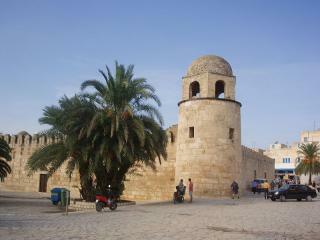 Sousse is considered one of the best examples of seaward-facing fortifications built by the Arabs. Its ribat, a soaring structure that combined the purposes of a minaret and a watch tower, is in outstanding condition and draws visitors from around the world. The city retains a medieval heart of narrow, twisted streets, a kasbah and medina. Sousse is an important port and tourist centre on the central Tunisian coast. Its old town and fortress are very nice to explore, although I'm not sure they are so exceptional that they belong on the WH list. Maybe they are representative examples of architectural styles. The Medina in Sousse is perhaps the nicest in the country to look at, and a cool feeling is given off by the white washed walls and blue medina doors. The Medina has more tourists than the other sites on the WHC list as it is next to the holiday resort stretch of the Tunisian coast, and this does mean that the atmosphere in the medina is not as genuine as in some of the other cities in the country and the quest for tourist money seems to have a more negative effect on shop owners!, but as any traveller knows that if you just go to some parts off the beaten track you will find a much more genuine picture of medina life. The Ribat offers great views of the Medina especially the Mosque, and the Kasbah perched at the top of the medina has some stunning mosaics and you get a good look at perhaps the best Medina walls in the country! Sousse is an easy place to visit due to it also being a beach resort and provides a great base to see some of the other UNESCO sites such as Kairouan and the Amphitheatre at El- Jem, also worth a trip is Monastir where the Ribat is stunning and doubles as Jerusalem in many films such as "Life of Brian"! Built in the 7th century: "Although Sousse had Phoenecian, Roman, Vandal and Byzantine manifestations nothing of these remained after its capture and complete destruction by the Arabs. It was rebuilt (albeit with reclaimed Byzantine materials) as a completely new city with its current name in the late 7C. It became ..an important commercial and military port during the Aghlabid period (800-909) and is a typical example of a town dating from the first centuries of Islam" (AB). Only the 'Ribat' (a dual purpose Fort-Monastery) remains from that initial rebuilding period. 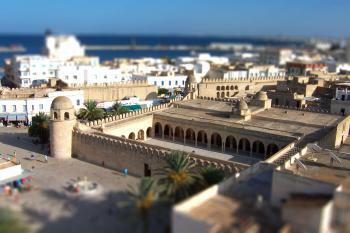 Other extant structures within the Medina were constructed in the following century e.g The Bu Ftata and Great Mosques.